When interviewing an artist about his latest album, it’s such a treat to get to visit the studio where the music was actually recorded. 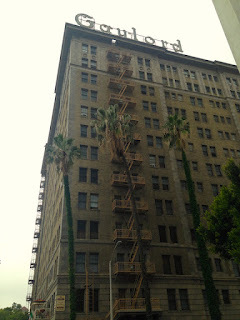 Such an experience is even greater when the location is as rich in history as the Gaylord Apartments. Spain’s sixth release, Carolina, was recorded in musician Kenny Lyon’s (the Lemonheads, Divinyls, NoFX) studio that is located in the building (Drummer Danny Frankel (John Cale, k.d. lang, Lou Reed) laid down his tracks at his home in Joshua Tree.). Kenny played acoustic and electric guitars, piano, keyboards, banjo and lap and pedal steel on Carolina, and he also served as the album’s producer, engineer and mixer. Kenny graciously opens his doors at the Gaylord to Josh and I the day after Spain’s first show of a three-week residency at the Love Song Bar. The trio premiered songs from the new album, which is set for release June 3, and they also play tonight, May 10, and May 17. After Josh and Kenny show me the studio space, we sit down to discuss some of Josh’s musical history, Carolina being a bit of a departure from past Spain albums, the rekindling of his passion for storytelling and how he began to deal with the death of his father, groundbreaking jazz bassist Charlie Haden, while writing the new songs. From “Battle of Saratoga,” which tells the tale of a heroin-addicted musician trapped in his New York hotel room by a snowstorm in the 1960s, and recounting the Farmington Mine Disaster of 1968 in “One Last Look” to the world of a 1875 homesteader in “Tennessee” and images from Josh's own childhood in Malibu in “Station 2,” Carolina is full of vivid portraits of a wide range of characters. The bottom floor used to house a grand ballroom, which became a nightclub called the Gay Room in 1948. This space eventually became the nautically themed HMS Bounty bar in 1962. In days past, the original Brown Derby restaurant sat just to the west, while the Ambassador Hotel – where Robert F. Kennedy was assassinated in 1968 and currently the site of a group of schools named in his honor – and its famed Coconut Grove nightclub was located across the street from the Gaylord. Although Koreatown is rapidly gentrifying, and change is happening all around the HMS Bounty and Gaylord, there is still an air of old-school elegance to the building’s lobby, patio and pool area. Josh informs me that jazz musicians would stay at the Gaylord when touring, and Kenny points to a pile of rubble across the street that used to be a jazz club. Charlie Haden first saw saxophonist Ornette Coleman – who eventually became his longtime associate – play at a club that was formerly around the corner from the Gaylord, so the area definitely has significance to Josh. He has vivid memories of being 12 and hopping on a bus from Malibu with a friend to attend the Los Angeles Comic Book and Science Fiction Convention at the Ambassador Hotel. Josh also has strong memories attached to a certain album he would stare at in his parents’ record collection as a child. As he grew up, Josh and his buddies would listen to AC/DC, Led Zeppelin and Van Halen, but that all changed one day when another friend introduced them all to something else entirely. It was around this time when Josh began playing his own music. Although he harbored dreams of being a writer, all Josh wanted to do at this time in his life was play music. Josh shared all of the bands that were inspiring him with his dad and his three sisters – Tanya, Petra and Rachel. He formed Spain in 1993, and their debut album, The Blue Moods of Spain, released two years later. The album featured the haunting song “Spiritual,” which has been covered by artists that run the gamut, from Johnny Cash to Charlie Haden and Pat Metheny. Spain went on to release two more albums, She Haunts My Dreams and I Believe, before taking a break then reforming in 2007. 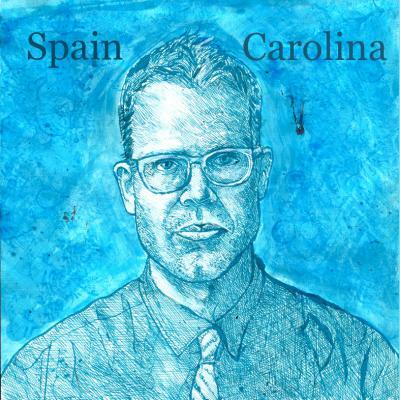 With Carolina, Josh makes a conscious effort to move away from Spain’s past material, and the album artwork is indicative of this. While he admits to loving too many restaurants in his neighborhood of Silver Lake, Josh does have a few favorites. As Spain gears up for a month-long European tour, Josh admits to really only missing two things when he’s away from home: his family and good Mexican food. He thinks Los Angeles is great, but if he had his way, he would live in New York City and make every Angeleno spend time someplace else. Carolina will be available June 3. Spain performs May 10 and 17 at the Love Song Bar. For more information, visit spaintheband.com. Great story and thank you for doing the accurate & thorough research on our happy home. I had such a lovely time visiting a building that I've admired for years! Thank you for taking time to read the story. Just to clarify: I DID tour and record with the Lemonheads for years. With the Divinyls; with a host of wonderful artists. I did play on a NOFX album. But Sting, Springsteen, Joe Walsh? That's a bit misleading. Yes, I played with them: once. As well as Elton John, Herbie Hancock, Rick James (okay, Herbie three times, and Rick many times...) among others. But that was when I was a member of the China Club House Band. It was a sit-in situation. And that's it)) Thanks.